In the middle of the night, Sweden got a new Princess. She has no name as yet, so right now she’s Princess Thing. Not only has her mother, Crown Princess Victoria, given birth to her first child but she has also provided Sweden with the next monarch. Unlike many other countries in the world, Sweden’s line of succession to the throne goes to the first born, not necessarily the first son. 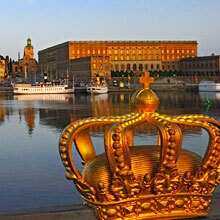 Sweden adopted this equal progmeniture in 1980 when the current king had his first child, which happened to be a girl. Up until 1980, the throne went to the first-born son. For example,the king himself is the youngest child with several elder sisters. This change on the law reflects clearly the Swedish belief in gender equality even up in the higher echelons of society. Nowadays, it sounds ridiculous to us in Sweden that elder sisters would forgo their right to inheritence/title/estate just because they are female and have younger male siblings. It feels dusty and old-fashioned. Only in 2011, was there an agreement in the UK to change the law in a similar way. Any future child of William and Kate, regardless of gender, will be heir to the throne after William. Hi! Thanks for the correction! And thanks for reading my blog.